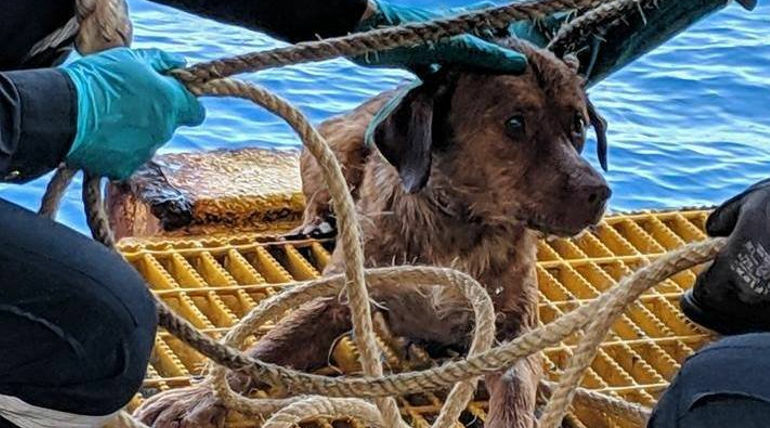 Dog swimming near an oil rig off the coast of Thailand was rescued by the oil rig workers. The oil rig situated around 130 miles offshore saw a new entrant on Tuesday and the canine was see swimming and struggling at mid-water. The workers noticed the dog and decided to help and save its' life. Vitisak Payalaw, the oil rig worker along with his mates helped out the dog and gave a pole to climb up. The dog could not make it the pole and kept slipping while climbing. Then they decided to pull it with a rope and threw a rope towards the dog. The dog was then brought to the shore, given some fresh water and electrolyte drink. "I thought that if we didn't move quickly, I would not be able to help him, If he lost his grip, it would be very difficult to help him, his eyes were so sad. He just kept looking up just like he wanted to say, 'please help me' said Payalaw to a local media. He added "At that moment, whoever saw this, they would just have to help, he looked extremely exhausted and ran out of energy. He didn't move much, he was shaking and he couldn't stand, he had to sit all the time." The crew named him Boonrod, which means 'survivor' and Payalaw posted the dog's pictures in social media sharing hs happiness. He said that he would like to adopt the dog if nobody comes forward to claim Boonrod.